Nicci has been our dedicated Head Nurse since 1997. She has been nominated again as Pet Plan Nurse of the Year 2017 and has received nominations in previous years. 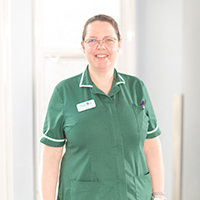 Nicci was a student veterinary nurse at Barton Lodge Veterinary Centre when she first left school and achieved her VN qualification in 1992. She gained wide experience by working at The Royal Veterinary College and then at another veterinary practice before returning to Barton Lodge in 1997. She has overall responsibility for our Nurse Team and organises and runs the Nurse Clinics and Puppy Parties. She is particularly interested in pet behaviour issues and runs clinics were she can be consulted by clients to give help and advice about their pets problems. Outside work she is involved with a local running club, Gade Valley Harriers. She has succesfully completed the London Marathon seven times and competes in local cross country and road runs. She also enjoys attending a local gym. Nicci has had many pets, all of which have been adopted through her work. Scrumpie, Widget and Gypsie enjoyed accompanying her during her training runs. She now has 2 lurchers called Bella and Sadie. She also has 3 cats, Neno, Soames and Kwasi plus her tortoise Emma. She sometimes takes her pets into schools where she has given pet care talks which are very well received. Nicci has two children, Sam and Charlotte.